Whenever our children reach a certain milestone, it’s always exciting to share memories in social media so to keep our friends and relatives updated. It’s no surprise that as a mom, you may have taken hundreds of photos of your kids during quirky and important moments, and all you want to do is use all of these images and put them in a creative scrapbook that you can share online. While you can upload albums and multiple photos on Facebook and Instagram, it lacks a personal touch and narrows the space for being crafty in the digital realm. A solution is to download a scrapbook-friendly editing app to fill your craft-making void, and the new version of Instasize is the perfect one to download. Available in iOS and Android, the new version has the right tools and features that will hone your creativity and give stunning results that you will be proud to share online. 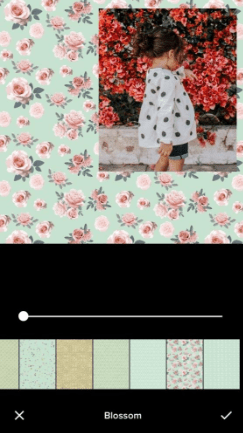 Here are simple ways on how to curate the cutest, most eye catching online scrapbooks using the Instasize app. Instasize has an easy-to-use collage tool with multiple layout options that allow you to upload as many as 6 photos. As soon as you’re able to choose the photos you want, it’s easy to edit and customize the collage. Tap and hold photos to drag and swap positions according to your liking so you can feature your favorites. The app allows you to edit every single photo to adjust its brightness, exposure, saturation, tint, shadows, and even add grain for a vintage effect. One of the distinct qualities of a fun scrapbook is a printed backgrounds that command its personality. You can easily achieve this look by adjusting the width, thickness and appearance of the border to match your theme. There’s a printed border for every mood: from simple designs and solid colors to geometric patterns, you can be certain that there’s a printed border for your scrapbook. What’s a scrapbook without labels to identify specific moments? A scrapbook gains all its quirky character with the labels you put in it, especially if you’re curating one that showcases all the important memories of your kids you want to keep. Instasize has an amusing text tool that offers a wide range of emotive fonts, and it eliminates the need to download a separate app for text inserts. You can adjust font sizes to input as much text lines as you want without overpowering other elements of your scrapbook. Instasize also allows you to incorporate striking typography designs in your scrapbook without the need to go through tedious editing processes. Typography is pretty to look at, but it could to be a chore to master and execute, especially with all the editing technicalities involved such as the kerning, tracking, and leading. Instasize’s Text Styles tool has 10 fun text designs that will add a lively touch to your scrapbooks. You can even put in short motivational quotes that will go well with your scrapbook’s theme and they will look like you took them out from a poster! One of the strongest editing features of the Instasize app is its wide selection of artisan crafted photo filters. It has more than 50 filters that give off stunning results and they will make your photos look like they went under the hands of an editing professional. 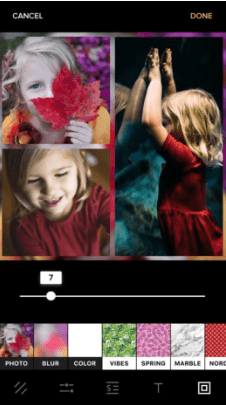 Since there is a huge selection of filters you can choose from, your scrapbook-making skills will have an extended reach; it allows you to edit and adjust the color tones of each photo to your liking. You can lighten and sharpen photos, and even adjust the intensity of the filter, and its tints and hues. This gives you more freedom to think of color themes and motifs regardless of the color way or quality of the photos you want to use. Whether you’re going for a light and luminous effect, or thinking of applying a stylish, vintage touch, these Instasize filters will sort you out. One of the most creative ways to use Instasize is by making full use of its Borders Tool. Aside from having the usual thin proportions for a border, you can minimize and maximize the size of the image and select its location within the border for a layered, collage effect. 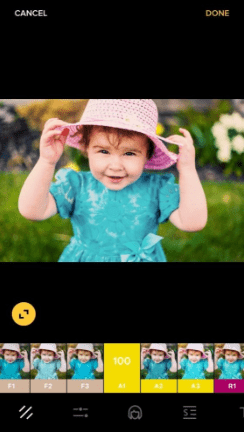 Instasize already has a decent selection of border styles and prints, but you can push your creativity further by saving prints or images you want and then uploading them to become background images. This layering technique is perfect if you want to emphasize certain themes in your scrapbook. 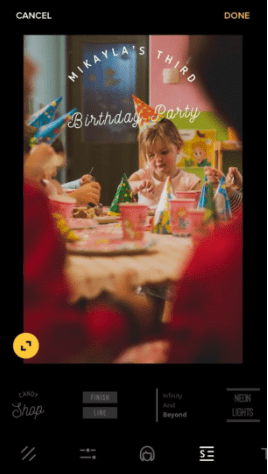 If you’re making one for your baby’s birthday, you can save images of balloons or confetti and then putting your photos on top of them through this tool.